You probably know more about wine than you think you do. Knowing what you like is half the battle. You may have heard this advice a million times over but the best way to learn about wine is to taste, taste, and taste. Opportunity is everywhere. 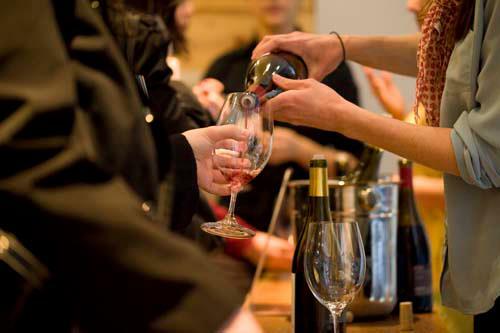 There are free tastings, paid tastings, wine dinners, food pairings, blind tastings, classes, and festivals all available to the burgeoning wine lover. These occasions are meant to be fun but why not take something away from the experience that will help you next time you’re picking out a bottle of wine? The most difficult part about selecting a wine is probably communicating what you like so that you are happy with what ends up in your glass. The most obvious benefit of a wine tasting is that you get to sample the wine before you buy it. You won’t always get to taste before you buy, however, so here are a few tips on how to get the most out of the tasting experience and apply what you’ve learned later. Don’t be intimidated. Seriously. Wine can seem daunting at times but, at the end of the day, it’s a beverage. A beverage with intoxicating qualities. You can’t get much friendlier than that. Engage the person pouring the wine. Chances are this person would rather talk to you than stand there like a mannequin for two or three or four hours. So, loosen up. Start a conversation. You just might learn something. Ask questions. Sometimes wine professionals take things for granted. For example, that the Russian River Valley is a wine appellation in Sonoma, California and that Bianchello is a grape grown in Italy. If you’re confused (wait, they grow grapes near a river in Moscow? ), just ask. There was most certainly a time when they didn’t know that Wachau and Salta are wine regions and Arbois and Vitovska are grape varieties. And it probably wasn’t that long ago. Ask more questions. If you particularly like or dislike something, try to explain why and ask the pourer how he or she would describe it. If you say something like, “it tastes too tart to me”, you might not like wines that are high in acidity. You’ll know that in the future you can ask for softer, rounder wines with low acidity. Don’t be a know-it-all. No one likes a smarty pants. Maybe you think you know more than the person who’s pouring the wine but who can be sure? If you think a wine should be more chilled or there is a fault in the wine or you think it’s a travesty that there are no crackers, posing your gripe as a question rather than a supercilious statement is always the best policy. Try everything. Don’t skip the Chardonnay because you “hate Chardonnay” or the Pinot Noir because you “only drink white wine.” Expand your horizons and you never know what you might discover. If you really do hate what you’re tasting, pour the rest of it out and move on. Everybody wins. Take a picture, it lasts longer. If you like something, take a picture of the label. You might think you’ll remember it but you won’t. A simple smart phone photo will do but there are also apps such as Delectable that do a lot of the work for you. Write it down. This may seem a bit extreme when you are out tasting wine having a good time but it’s good practice. Jot down some simple notes in an e-mail to yourself or use apps such as Delectable or Hello Vino. Skip the gum & coffee. It’s just a casual tasting but you are not doing your palate any favors if you walk in snapping gum or toting a pumpkin spice latte. The true aromas and flavors of the wine will be overpowered and you won’t get the most out of the experience. Don’t feel pressured to buy. Wine tastings are meant to drive sales, especially the free ones, but that doesn’t mean you should feel obligated to purchase what is being poured. If you don’t like the wines on offer one week you may like them the next. If you want to buy something else, communicate to the salesperson or server why you didn’t like what you were tasting and you’ll probably end up with something you love to drink.